Not everyone decides to open a local bank account when they move to Cambodia. Should you? We help you break down the cost of taking money out of ATMs, so you can decide for yourself. Luckily, there are plenty of ATMs to choose from in Phnom Penh, so you can access your foreign bank accounts and buy all of the cheap beers you can drink. ATM fees have, unfortunately, been going up in the past year. Canadia Bank ATMs used to be free, now it charges $5 per withdrawal. Mekong Bank also used to have no fees and now has joined the $5 per transaction crowd. 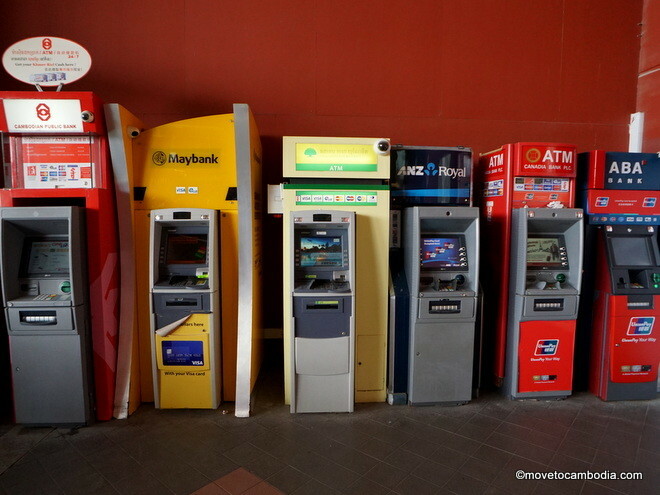 Unfortunately it sounds like Maybank no longer offers free ATM withdrawals, either. These fees add up — withdrawing just four times per month (which, if you have a typical daily withdrawal maximum of $500, means you have a fairly average $2000/month Phnom Penh lifestyle) and you’ll pay $240 per year in fees (plus any fees your own bank can add!). Are you one of the unfortunate souls with a MasterCard Debit/ATM card in Phnom Penh? There are a few Visa-only ATMs in Phnom Penh, but it’s not that bad. ABA, ACLEDA, ANZ, Canadia, and Mekong all take both Visa and MasterCard and are the most ubiquitous. Keeping it riel: there are a few ATMs that dispense Cambodian riel. Most ATMs dispense US Dollars if you use a foreign card. 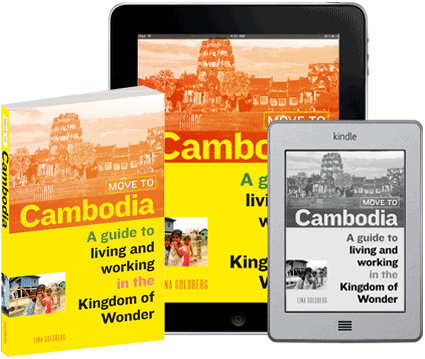 This is really helpful if you are staying in Phnom Penh and Siem Reap (and the main parts of Battambang, Kampot, and Kep) where most prices are in USD, but not so much if you are headed to any of the other provinces and lovely towns villages outside of these urban centers. 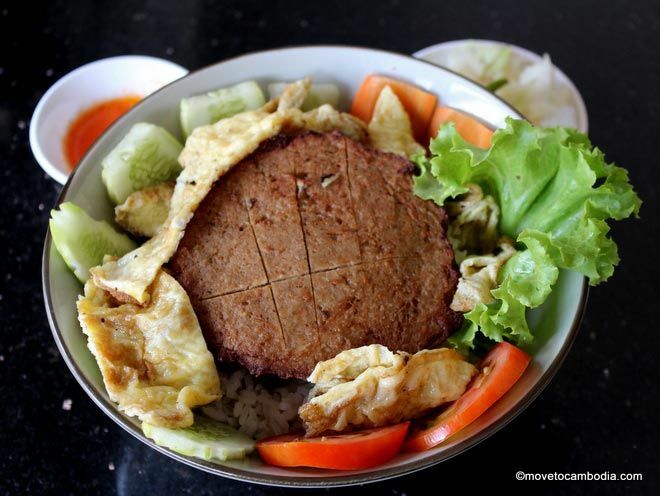 If you prefer to take out riel rather than go to a money changer, ABA Bank and Mekong Bank ATMs dispense riel. 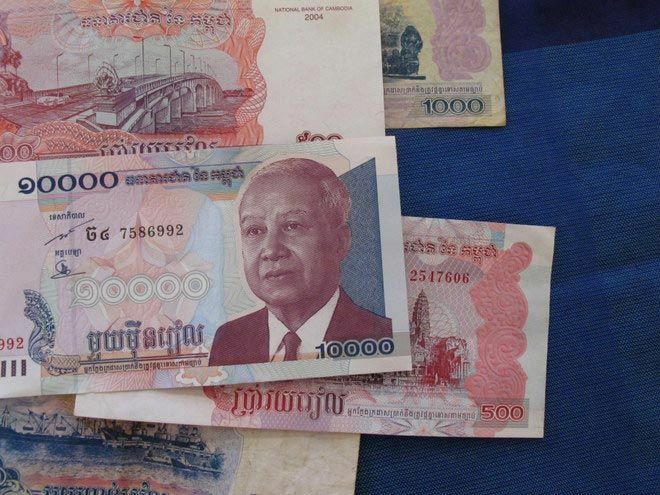 Warning: most Phnom Penh ATMs spit out the largest bills possible, and it can be hard to get change (unless you want to be the one in charge of making sure everyone pays their share of food and drink at your next big group dinner). We recommend withdrawing an amount in USD that is not a multiple of $50– taking out $380, for example, will give you four $20s and three $100s rather than the four awkward $100 notes you would generally be saddled with if you withdrew $400. There are new banks popping up all the time, let us know in the comments if you discover any no-fee ATMs in Phnom Penh. This entry was posted in Practicalities and tagged banking, ATMs. Bookmark the permalink. Sathapana Bank is without fee and you hab choose if you want Dollar or Rial. I tried last night and it was actually the worst offender (at least the one on the Riverside)! 2% and Minimum (!) $5. Craziness. Was the fee from your home bank or the ATM bank? My home bank has no fees and free foreign exchange. Tal, I must have been there around the same time and came here specifically to post this ($5 at each end in my case). The MB bank atm on riverside is ‘in’ the restaurant on the corner, but it was out of order then. In case you travel to VIETNAM after Cambodia. The Mb bank ATMs in VIETNAM were charging a 2$ fee! Even though no fees were mentioned at withdrawal! But Checking my credit card balance showed different. (Sep 2018) I’ve used my European Visa Electron and on the ATM it said that a 5$ fee will be charged. So therefore European Visa cards are charged as much as any other card. UPDATE: As of August, 2018 Maybank is no longer free for US VISA cards unfortunately. They charge 5 USD per transaction. I failed to mention before, Maybank also reduced the maximum withdraw amount per transaction. It is now $500 USD.